Andrew Gillum has more free time than he would like. 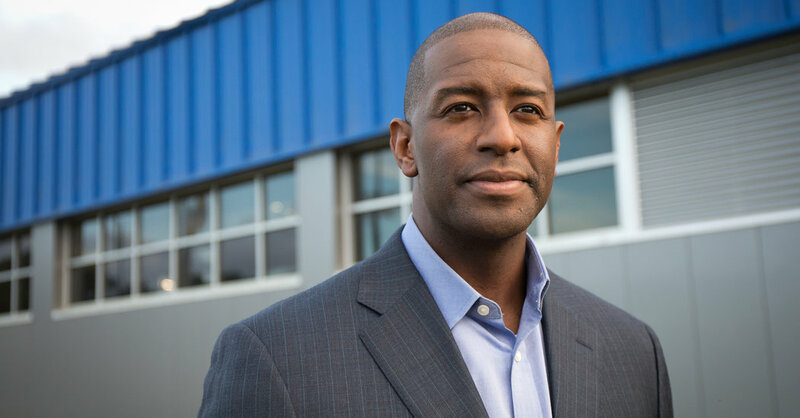 Mr. Gillum spoke with The New York Times about why he’s confident Democrats can wrest Florida from Mr. Trump in 2020, what he hopes to see from the primary field, and how he grades the performance of the Republican who beat him last year, Gov. Ron DeSantis. I heard your father recently passed and wanted to offer my condolences. That means a lot, I really appreciate it. How serious were you thinking about running for president? Did you give it real thought? Everybody has to consider what role they play in Trump’s America right now to bring this to an end. But for me, it was a pretty quick consideration. I had to put into focus that I’d spent the better part of two years running around the state of Florida and away from my three children and my wife. If Beto O’Rourke can get into the presidential race, why not Stacey Abrams or Andrew Gillum? Is that a sign of privilege, as some have suggested? There’s no doubt that O’Rourke enjoys a set of privileges in his decision making that other candidates don’t. Can you imagine it for any of the women that are in the race for president or considering a run? They probably could not muse out loud, or in the recesses of their mind have these sorts of conversations and then say them out loud, and think it would be taken seriously or they would be taken seriously. I recognize that, but, as I understand it, the congressman also recognizes that there is privilege that accompanies him here. That doesn’t make him less deserving of consideration, it’s just something that has to be acknowledged. I think over the course of this race, we will — and America will — discover what Beto O’Rourke’s views are. And I think he’ll be measured on that. What’s the importance of this effort you’re announcing Wednesday? It’s Florida-specific, right? This is Florida-specific, but guess what — Florida-specific impacts the nation. Twenty-nine electoral voters answers a lot, and not just for the state, but for the country. My dad used to give me this advice a lot: “Son, when you know better, you do better.” And having just come from two years on the campaign trail, and having looked very critically at my own race, there’s some things I learned that I recognize that we can do better at. When Obama was on the ballot in 2008, Democrats enjoyed a registration advantage of almost 800,000. When I showed up on the ballot, that advantage had shrunk to less than 300,000. And it makes a difference, if you have more marbles on the table and more voters you can choose from and have the opportunity to produce. Given the migration patterns in our state, and given the challenges we have around producing an electorate that’s favorable to Democrats to get out and vote — we’ve got to put more people in the game. Florida is tired of being a cheap date. You can’t just come in when it’s a presidential election and we’ve got a nominee and then do a few months of organizing. Republicans have been disciplined in our state in that way now for 24 years. And now it’s time for Democrats to do the same. Is this work only happening now because the Democratic Party and state party historically dropped the ball? When you don’t have a governor who can raise money for a party in 24 years, it’s very difficult for you to expect that party to turn on a dime and pull rabbits out of the hat. I’d say it’s a failure, writ large, of how people have treated Florida when it comes to organizing. It’s a state to go to when you want a presidential win, but outside of that? Good luck. What are you looking for the Democratic presidential candidates to prioritize? I am convinced that, through our primary process, we will produce the person who’s our strongest bet toward winning the White House. I hope whoever that is will be closer to my ideological end of the spectrum, but the truth is these primaries tend to produce candidates who are likely going to be our best bet to compete against Donald Trump. And more than anything, I think Democrats want to win. But what about a Joe Biden-esque figure, a moderate who doesn’t have the same type of progressive message you ran on? Whatever message Joe Biden may carry is closer to what I carry than Donald Trump’s. But if you’re Joe Biden, you’re really going to have to search the recesses of your past and make sure that you’re ready to reconcile those places that will put you outside the mainstream of where Democrats are today. And I expect that that’s probably part of the preparation to him entering the race, right? He’s got a long record, and there’s a lot for him to mull over, and a lot for him to assess where he’s evolved. And maybe where he hasn’t. Has Governor DeSantis been more pragmatic than you thought he’d be? The governor recognizes what I know, which is, 30,000-odd votes separated the two of us. We each got 4 million-plus votes, and the difference was practically a rounding error. So the governor did what I think any smart politician would do: He reduced those areas in the early phases that would divide. He tacked a little more toward a pragmatic and less ideological place, and that has produced some good will for the governor. The test is how he performs, now that he has a Republican-controlled House and Senate that may push him back to either his natural leanings, or create a contrast within his party. I know you have to go, but I keep coming back to you, Beto O’Rourke, and Stacey Abrams. It is striking that the two black candidates are currently going to work in grass-roots organizing and the white candidate is running for president? You don’t have anything else to say on that? Listen, man, we’re used to working.